During normal combustion, the fuel-air mixture burns in a very controlled and predictable manner. In a spark ignition engine, the process occurs in a fraction of a second. The mixture actually begins to burn at the point where it is ignited by the spark plugs. It then burns away from the plugs until it is completely consumed. This type of combustion causes a smooth build-up of temperature and pressure and ensures that the expanding gases deliver the maximum force to the piston at exactly the right time in the power stroke. 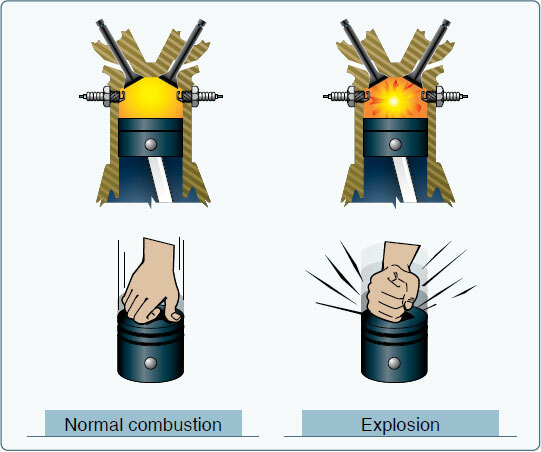 [Figure 7-21] Detonation is an uncontrolled, explosive ignition of the fuel-air mixture within the cylinder’s combustion chamber. It causes excessive temperatures and pressures which, if not corrected, can quickly lead to failure of the piston, cylinder, or valves. In less severe cases, detonation causes engine overheating, roughness, or loss of power. Figure 7-21. Normal combustion and explosive combustion. Ensure that the proper grade of fuel is used. Use an enriched fuel mixture, as well as a shallow climb angle, to increase cylinder cooling during takeoff and initial climb. Preignition occurs when the fuel-air mixture ignites prior to the engine’s normal ignition event. Premature burning is usually caused by a residual hot spot in the combustion chamber, often created by a small carbon deposit on a spark plug, a cracked spark plug insulator, or other damage in the cylinder that causes a part to heat sufficiently to ignite the fuel-air charge. Preignition causes the engine to lose power and produces high operating temperature. As with detonation, preignition may also cause severe engine damage because the expanding gases exert excessive pressure on the piston while still on its compression stroke.